I liked this wine better from cask as it appears to have dried out quickly, which is a danger with many of these 2007s. Currently, the wine is very tannic, the extraction seems pushed, and the fruit appears to have fallen out. Nevertheless, there are attractive plum, earth, and spice characteristics in the complex aromatics, but lean, austere tannins kick in in the mouth. It has not turned out as well as I had hoped. 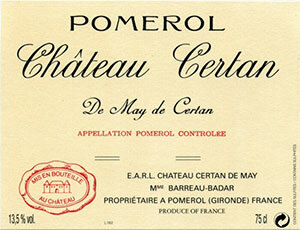 Tasted at BI Wine & Spirits' 10-Years-On tasting, the 2007 Certan de May was rather disappointing on the nose compared to previous showings, seeming to have lost some of its fruitiness, replaced by tertiary, mushroom-like aromas that lack some delineation. The palate is medium-bodied with grainy tannin, moderate acidity, quite masculine with some dryness creeping in on the attenuated finish. I would consume bottles in the near future. Tasted February 2017.